If you can't make it to an event, the council have also launched an online survey that will run until 17 February that you can find at www.norfolk.gov.uk/greenways - but please go to an event if you can. First off, this is basically a great idea, OK? But one big elephant in the room is what the surface will be. Will the routes be useful tarmac cycleway for commuters even in winter, or will it be another horrible "off-road" mudbath and sandpit like the other Norfolk Cycle Trails at Marriott's Way and Peddars Way? It's rather worrying that the consultation holds up Marriott's Way as an example of an existing greenway: that's only all-weather tarmac for the last few miles from New Costessey to Norwich City Centre. So, in case you couldn't guess, a key point to make repeatedly in the survey is that the surface must be all-weather all-cycles. Suggest they look at neighbouring countries like France, Belgium or the Netherlands if you've been there: cycleways are basically built as half-scale roads. Another key point probably should be that not all parts of these routes are needed as much as others. While it would be great to ride whole rail trails, we really really need the Lynn-Hillington, Snettisham-Heacham and final approach to Fakenham more than the others because the alternative roads are really pretty nasty and limit cycling. Where they cross main roads, it needs to have some decent crossings, too: no repeats of the Hospital or Hardwick Roundabouts. personal data - we have to agree to this to fill out the survey! how likely are you to use each? Please say you'll use the Lynn ones. how far would you travel to them? Very strange question - surely it depends how far away you live from them? suggest other greenways: I suggest that we would really like Lynn-Swaffham-Dereham, which would be the continuation of the Sand Line Path which currently runs only from the Walks to Fairstead. That could then connect to the A47 improvements being done Dereham-Costessey and finally give us a very direct route to Norwich. Fakenham-Themelthorpe-Whitwell would improve Route 1's connection to Marriott's Way. Put in any others you think would be good. suggest heritage features: put in any that you've seen. surfaces: the bound surfaces should be machine-laid and smooth enough for use by road bikes with 100+psi sub-inch-wide tyres. The suggested "low use" gravel surface seems unsuitable for the sections with no quiet road alternative and should be replaced by a bound surface. Norfolk no longer builds gravel roads for motorists, so they should not treat people cycling and walking as second-class: please use tarmac. what could be made available along the greenway to encourage interaction? How about signs to local village features like the cafes at East Rudham? Any other ideas? wildlife: I don't know much about this, so I suggested they ask the wildlife trust and RSPB. Put what you know. usage: please say you'd use them for cycling and whatever else you would. other comments: please point that the Lynn-Hillington, Snettisham-Heacham and entry to Fakenham sections would fill in vital missing links in the cycleway network and should be prioritised and built first. In general suggestions, say it's important to link the greenways to existing cycle routes. Put in anything else you'd like. the rest of the questions are about you - answer them as you feel. 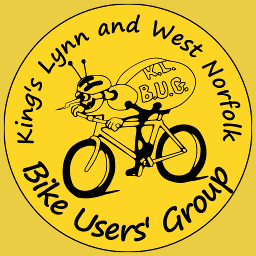 Please say on facebook or other social media that you've responded to the consultation and suggest to other bike users that they go to events or fill out the survey too. Remember: the survey closes 17 February, three days after Valentine's. Show you Love West Norfolk by helping to give it more cycling!